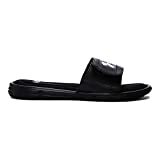 Interested in the Under Armour Mens Ignite V Slide Sandal Black (001)/White 11? Is the price too high? You can easily price watch this product and we'll notify you when the price reaches your target.